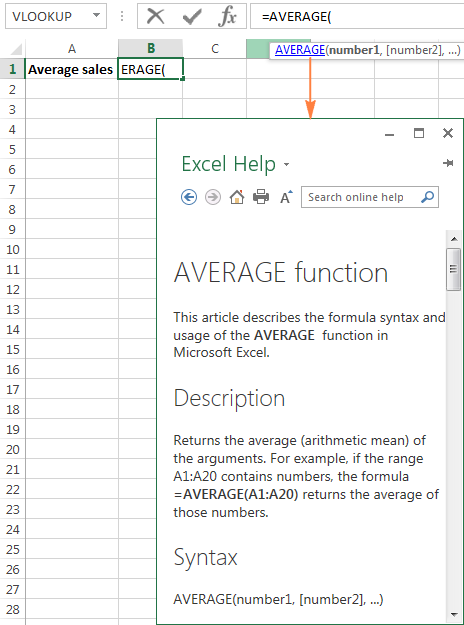 The tutorial explains how to write formulas in Excel, beginning with very simple ones. You will learn how to create a formula in Excel using constants, cell references and defined names. 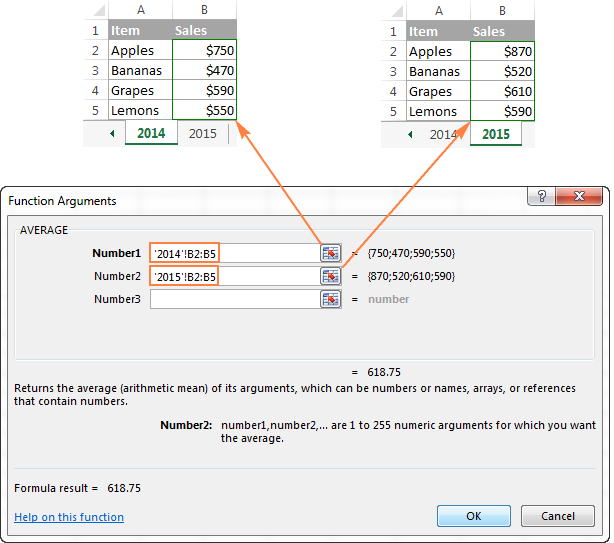 Also, you will see how to make formulas using the function wizard or enter a function directly in a cell. In the previous article we've started to explore a fascinating word of Microsoft Excel formulas. Why fascinating? Because Excel provides formulas for almost anything. So, whatever problem or a challenge you are facing, chances are that it can be solved by using a formula. You just need to know how to make a proper one :) And it is exactly what we are going to discuss in this tutorial. For starters, any Excel formula begins with the equal sign (=). So, whatever formula you are going to write, begin by typing = either in the destination cell or in the Excel formula bar. And now, let's have a closer look at how you can make different formulas in Excel. Select a cell where you want to output the result. Type the equal symbol (=), and then type the equation you want to calculate. Press the Enter key to complete your formula. Done! Instead of entering values directly in your Excel formula, you can refer to the cells, containing those values. When making such a formula, you can type the cell references directly in the formula, or click the cell and Excel will insert a corresponding cell reference in your formula. To add range reference, select the range of cells in the sheet. Note. By default, Excel adds relative cell references. To switch to another reference type, press the F4 key. A big advantage of using cell references in Excel formulas is that whenever you change a value in the referred cell, the formula recalculates automatically without you having to manually update all the calculations and formulas on your spreadsheet. To take a step further, you can create a name for a certain cell or a range of cells, and then refer to that cell(s) in your Excel formulas by simply typing the name. A professional-like way to define a name is via the Formulas tab > Defined names group or Ctrl+F3 shortcut. For the details steps, please see creating a defined name in Excel. In the same manner, you can use names instead of cell or range references in arguments of Excel functions. 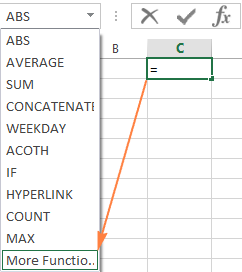 However, defined names make Excel formulas more understandable. Also, they can significantly expedite creating formulas in Excel especially when you are using the same range of cells in multiple formulas. Instead of navigating between different spreadsheets to find and select the range, you just type its name directly in the formula. Excel functions are nothing else than predefined formulas that perform the required calculations behind the scene. Each formula begins with an equal sign (=), followed by the function name and the function arguments entered within the parentheses. Each function has specific arguments and syntax (particular order of arguments). For more information, please see a list of the most popular Excel functions with formula examples and screenshots. If you do not feel very comfortable with Excel spreadsheet formulas yet, the Insert Function wizard will give you a helpful hand. 1. Run the function wizard. Alternatively, you can click the Insert Function button to the left of the formula bar. 2. Find the function you want to use. If you know the function name, type it in the Search for a function field and click Go. If you are not sure exactly what function you need to use, type a very brief description of the task you want to solve in the Search for a function field, and click Go. For example, you can type something like this: "sum cells", or "count empty cells". You can read a short description of the selected function right under the Select a function box. If you need further details regarding that function, click the Help on this function link near the bottom of the dialog box. Once you've found the function you wish to use, select it and click OK.
3. Specify the function arguments. 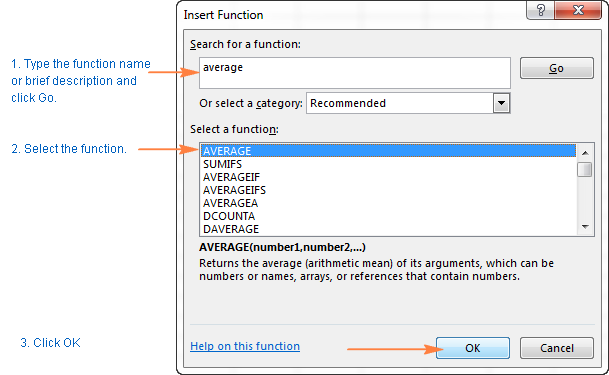 In the second step of the Excel function wizard, you are to specify the function's arguments. Good news is that no knowledge of the function's syntax is required. You just enter the cell or range references in the arguments' boxes and the wizard will take care of the rest. To enter an argument, you can either type a cell reference or range directly into the box. Alternatively, click the range selection icon next to the argument (or simply put the cursor into the argument's box), and then select a cell or a range of cells in the worksheet using the mouse. While doing this, the function wizard will shrink to a narrow range selection window. When you release the mouse button, the dialog box will be restored to its full size. A short explanation for the currently selected argument is displayed right under the function's description. For more details, click the Help on this function link near the bottom. Excel functions allow you to perform calculations with cell residing on the same worksheet, different sheets and even different workbooks. In this example, we are calculating the average of sales for 2014 and 2015 years located in two different spreadsheets, which in why the range references in the above screenshot include the sheet names. Find more about how to reference another sheet or workbook in Excel. As soon as you've specified an argument, the value or array of values in the selected cell(s) will be displayed right to the argument's box. When you have specified all the arguments, click the OK button (or just press the Enter key), and the completed formula is entered into the cell. As you've just seen, creating a formula in Excel by using the function wizard is easy, thought it's quite a long multi-step process. When you have some experience with Excel formulas, you might like a faster way - typing a function directly into a cell or formula bar. So, you can either finish typing the function name on your own or select from the displayed list. Either way, as soon as you type an opening parenthesis, Excel will show the function screen tip highlighting the argument you need to enter next. You can type the argument in the formula manually, or click a cell (select a range) in the sheet and have a corresponding cell or range reference added to the argument. After you've input the last argument, type the closing parenthesis and hit Enter to complete the formula. Tip. If you are not quite familiar with the function's syntax, click the function name and the Excel Help topic will pop-up right away. This is how you create formulas in Excel. Nothing difficult at all, is it? In the next few articles, we will continue our journey in the intriguing realm of Microsoft Excel formulas, but those are going to be short tips to make your work with Excel formulas more efficient and productive. Please stay tuned! 53 Responses to "How to make formulas in Excel"
I am a type of person who is always starving to learn something new of excel tricks and formulas. Is there a way to have an overview or get the lessons of the formula to how to use it? It will be much appreciated. The formula reads as follows: if cell C2 is not empty, return the text "Vehicle Fuel", otherwise return an empty string (blank cell). Thanks for your contribution on Excel. It is amazing. I used the dynamic data validation process mentioned by you. Keep up the good work. Thank you Deepanshu! I'm glad my articles have helped in your work. Thank you very much for providing the link. I went trough whole formulas in the provided link, they are really helpful I really appreciate it but the formula I need is a little more complicated. Suppose we have 1000 villages and we give a single unique ID to each village, for example: The given unique ID for "Village1" is "0001", Unique ID for "village2" is "0002",... and Unique ID for "village1000" is "1000". Then we type the formula that if in column A1 I put the Unique ID "0001", in column B1 "Village1" should appear automatically and if I put the unique ID "0002" in column A2, in column B2 "Village2" should appear... and finally if I put the unique ID "1000" in Column A3, "Village1000" should appear in column B3. I have the list of all those 1000 villages and giving and ID is simple but the only problem is the formula that if we use =If formula for the mentioned purpose, we will need to type each 1000 villages with their Unique IDs, that will take to much time and there is a big possibility of more mistakes for typing such a long formula, so do we have a simpler formula for the mentioned purpose? And thank you very much, you really do a great job and please keep it on :). The IF function is not quite suitable for this task. What you need is a VLOOKUP formula that can search for a given ID (lookup value) across the ID's list and return a match from another column (village). Just be very careful when assigning ids like "0001". Excel cuts off leading zeros in numbers and this may cause problems. hello mam! do you know a formula for: enter cash total, result (cash pieces of denominations and denomination multiplied to pieces). Looking forward to your positive response. thank you! It depends what you would like to transform. If you have a set range of values, you can use IF function, if the conditions are flexible, then you will need VBA code. If you can send a test spreadsheet to support@ablebits.com and describe the expected result, we'll do our best to help you. I have a issue of multiple line item of excel and want to make merge with the word document and also want to produce as a result which it should dispense to the single page of word document. Integration of Excel with other applications can be done only with the help of VBA code. I have a list of names that I want to match on another list. If it matches, I want it to enter a value in a cell. Example: I have a list of 50 names on one list. On the other I have another list of names with a column showing what group they are in (1, 2, 3 etc). I want to put a column next to the first list of names title group. I want the formula to go to the other list, find the name and enter the correct group number. Help? It compares the name in column A to the name in column A of Sheet2, and returns the corresponding group from the second column in Sheet2. (1) If a cell value is less than or equals to 15000 then its 12% should be calculated. (2) If the cell value is greater than 15000 then no calculation should happen. I AM TRYING TO FIGURE A FORMULA THAT WILL SUBTRACT TO CELLS. WITH ADDING A UNCONSTANT $ AMOUNT (1.5 x?) AND DIVIDED THE ANWER BY THE $ BY THE SUBTRACTED CELLS. Use text to columns function in the excel. if the difference btw A & B is less than 6 or equal to 6, "No Change"
if greater than 6 and less than 9, "Slight Change"
if greater than 10 "Significant Change"
I am having trouble writing a formula and have become extremely frustrated. I know .17 is 17% but is written as 1.17 in the excel formula. Is this correct? Should I be using .17 (which makes my mark-up off by a lot)or 1.17? If I am to use 1.17 why? I do not understand. PLEASE HELP ME!! I want a unique formula at the place of dots for all three calculations(after dragging in all three cells). it means "reference of the formula not value or range"
please I need a formula that will help me to manage my whole sale and retail shop . in fact I'm wondering which formula to use. please help me to find formulas that will help me to manage my whole sales and retail agro.chemical shop. Thanks for sharing such type of informative post with us. Keep it up. I'm looking for a formula that I have seen on google (mostly from your blog) but now I forgot and I searched lot on google but I didn't find what I'm looking for. In my formula I want to change/increase only row number/reference by '1' not column number/reference. hi, i have an issue writing a formula and am not sure if it could be done, but i would love to here your input. i have a spreadsheet made up for my work team and need a formula to turn particular arguments into a number. i have 5 guys on a team. i also have to take into account if its a night shift or day shift so i fill the cell colour red for night and blue for day. i also need to add to these arguments a figure regarding to the day of the week (wed) and the colour of the cell (day / night shift). unless there is a date picker around i could modify so it would ask what shift was done on the day/date selected. so for example. if i selected a cell the right click and choose a date from the date picker, the formula would then calculate a figure answer with the day of week and shift. shifts have different values. is it possible? and if so how would i go about this? thanks your help will be greatly appreciated. I need to have a date to mail out notices 90 days after a date in another column depending on if another column says needs testing. Is there a formula to do this, or do I just do this myself? How can i write equation in excel? b)the interest given the principle in A2,the annual interest rate in A3 and the number of years in A4,where interest is compounded every two months. Your kind response in help will be much appreciated. Hi I’m trying to find a formula or combined for predicting a future date from a set date depending on a cell value in another work sheet. Based on a score of 1 with an argument of next date is 20 days when a score is between 1-5.
hellow i need some help! 1) In regards with the formulas of Excel can i create my own formulas and How? Solve for Unknown 'N': ??? Hi, Can anyone tell me how to program this: I want h31 to be multiplied by 3.5% that i have in G32 and want the total of h31 g32 to total in h32. what will be the formula . The simplest way to get what you want is to apply some arithmetic and then formatting a cell as a number to display one digit. If you want to do this "automatically" you'll need to build some VBA code and that's beyond the scope of this blog. I'll show you the easy method. Let's say your number is in cell A2. Maybe it is 6145. First, in cell B2 enter =A2/1000. Next you'll format the cell B2 as a number with one decimal place. To format the cell, right click on B2, choose Format Cells, then choose Number, then select 1 decimal place. Click OK. The number displayed is "6.1". Some arithmetic, some formatting and you're home. x=100[((4a+b+c+d)e)-6]/254 where a, b, c, d, e have numerical values in various cells. Note the A1, B1, C1, D1 and E1 are cell addresses that you can modify. Note the asterisk Excel uses to signify multiply. Note there are no square brackets. I am trying to find a formula to figure out 6% sales tax. I would like to split 1.5x 2.5 which is in the same column. If we understand your task correctly, please have a look at our Split Cells add-in. It can help you separate your text into multiple columns or rows at a glance. The add-in is included in our Text Toolkit for Excel that contains 8 useful add-ins to manage text data in Excel (remove extra spaces, substrings and non-printable characters, change case, split cells, etc.). You can install a fully functional 7-day trial version of Text Toolkit and see if it works for you. Here is the direct download link. Don’t hesitate to contact us again if we can help in any way. * I had been looking for a new formula which"ll feed me with my kinda stuff. After several searches and experiments, i didn't stopped at nothing. I'm still in a thirst for it. * Consider a single cell containing a paragraph and there are "n" number of cells and what i need is to extract numbers or alpha's or both of a specific term which is repeated in each cell. * I know you might think im crazy LoL but it'd really be helpful to me if u help me in this.. Unfortunately, due to the volume of comments received we cannot guarantee that we will be able to give you a timely response. When posting a question, please be very clear and concise. We thank you for understanding! This comprehensive set of time-saving tools will help you accomplish any task impeccably without errors or delays. These 8 tools will boost your inbox productivity and simplify your emailing routine. This smart package will ease many routine operations and solve complex tedious tasks in your spreadsheets. Microsoft and the Office logos are trademarks or registered trademarks of Microsoft Corporation. Google Chrome is a trademark of Google LLC. Incredible product, even better tech support…AbleBits totally delivers! The best spent money on software I've ever spent! Ablebits is a fantastic product - easy to use and so efficient. Anybody who experiences it, is bound to love it! AbleBits suite has really helped me when I was in a crunch! It's the best $100 we've ever spent! I love the program, and I can't imagine using Excel without it! Thanks for a terrific product that is worth every single cent!